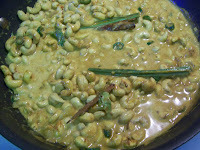 This recipe for cashew curry has to start with a small confession first...I refused to eat or even try Cashew Curry until I was almost 30 years old. It's a pretty popular Sri Lankan dish to entertain with, but I never wanted to try it because I avoided nuts in my savory food. Now I realize that I have missed out on years of good eating. I not only adore the cashew part of this dish, but the savory coconut gravy is simply amazing. My mother came over to show me her way of making cashew curry and it's really easy and absolutely delicious. Traditionally cashews are soaked in water to make them tender before cooking the curry, but my mother avoids this step because we like our cashews with a little "bite" to them so they are not too soft or mushy. I think they taste better with a little texture... you want to know you're eating a cashew after all. Of course you can cook the dish until you reach your desired texture... but don't cook away too much of the gravy because you will just love it. I am glad that I am over my food hang-ups regarding nuts in my savory food. Now, I am finally getting to try all the dishes I didn't want to try as a kid and working hard at making up for lost time. Heat about 1Tbs of canola oil in a pan. 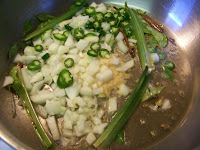 Add chopped onions, green chilies, curry leaves, cinnamon stick, panda leaves, ginger, garlic and a little salt. Saute until fragrant. 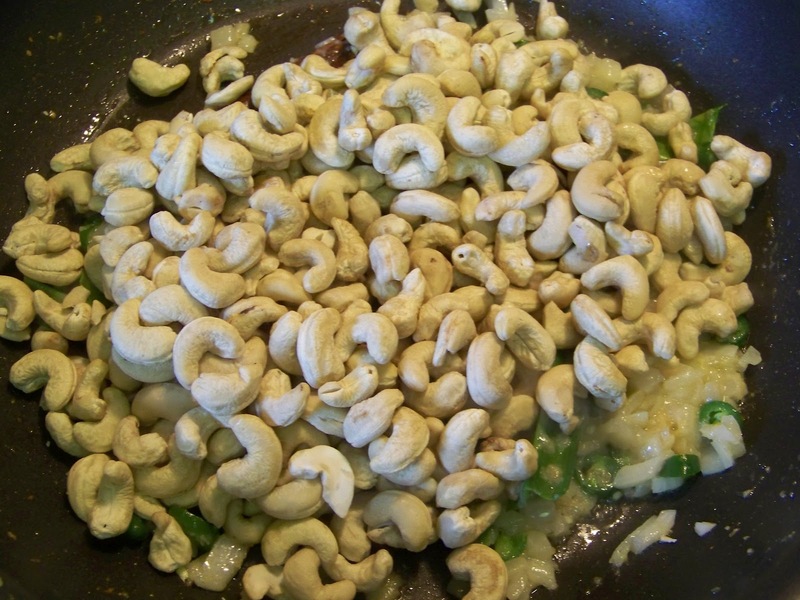 Next add the raw cashews and mix well with the sauteed ingredients. Now add the chili powder, curry powder and turmeric. Saute with all ingredients for 1 minute. Next add more salt to taste and the coconut milk. 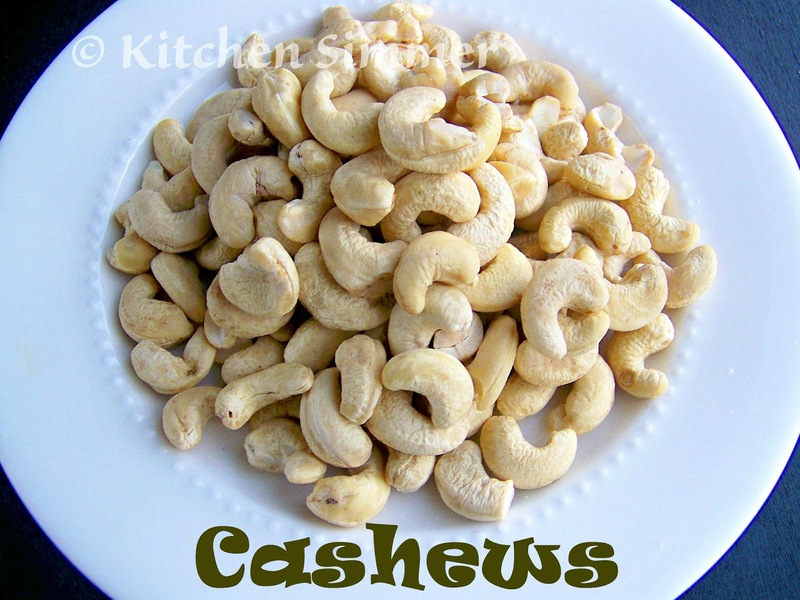 Simmer for 15-20 minutes until cashews are cooked to your desired tenderness. Taste for seasoning before serving. Enjoy. Wow! I've never had this...surprise... I can't wait to try it! 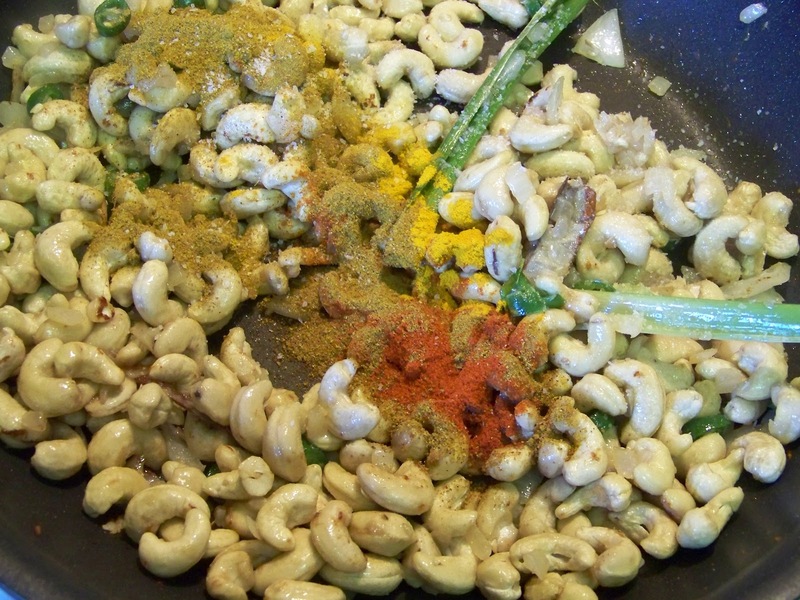 Sound delicious,great tip from your mom how to cook this cashew curry,I will like these cashew not too mushy,,I"m agree with that YUM !! Can't wait to try this recipe. 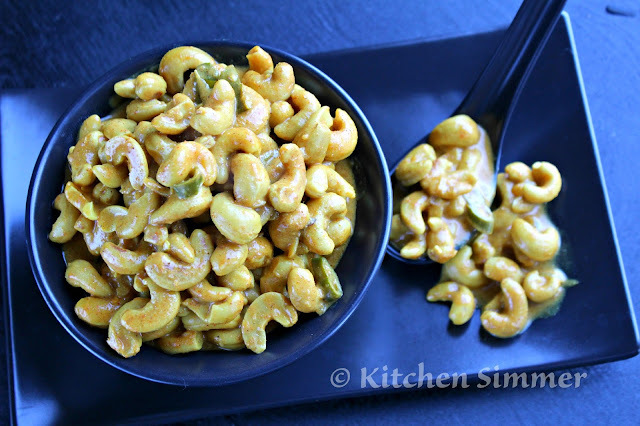 I love cashews and I love curries and now that we've gone nearly almost completely vegetarian (still having a bit of a hard time giving up fish, though), this is perfect for tomorrow's dinner. Oh, and as far as the cashews themselves go, I like them with a bit of 'bite' and/or crunch, too. When I've made curries with nuts in the past, I usually wait until nearly all is ready to be served up (about 5 or 6 minutes before), I'll add in the nuts and mix/stir-fry everything one last time. Yum! Thanks for this! Ramona this is a dish I am really going for. 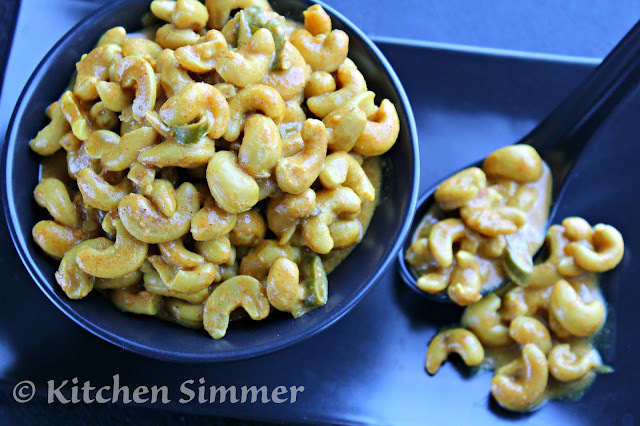 Love cashews and of course your curry recipes. 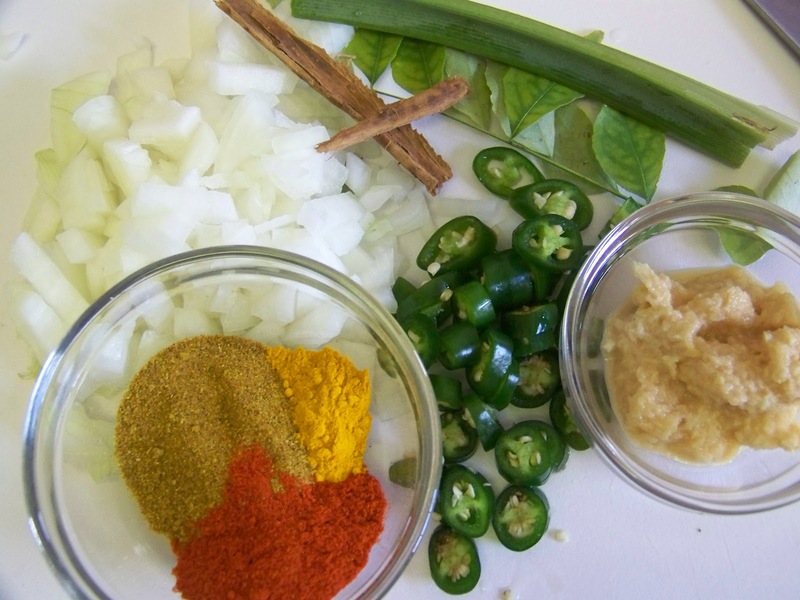 I am going to make this, I need to go get some more curry leaves. 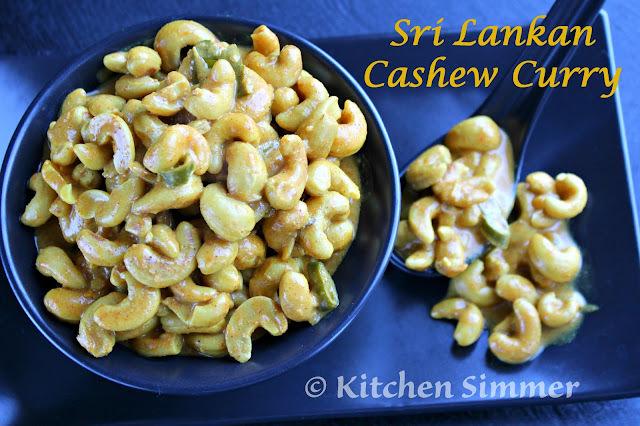 So glad you posted this I would never have thought to use cashews in curry. Did you serve it over rice?? This is SO fabulous and unique. We love cashews! Gorgeous! Oh not only do I love cashews but savory coconut gravy is quite the selling comment. Mmmmmmm....I think we are ALL cashew fans here! This looks fantastic!!! On first glance, I was like oooh, Mac and Cheese, upon closer inspection, even better! Curry! I was salivating as I read through this post--looks fabulous! We are all big cashew fans here. 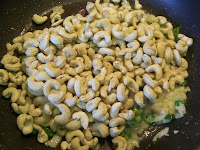 I had no idea there was a curry with pretty much only cashews - heaven! This is so different! Never in a million years would I think of a dish like this. It looks delicious and I can't wait to see what else you and your mom cooked up. Cashew curry? Really? Have never heard of it or seen it! Being a huge cashew lover I would never turn down a tasting. So glad you finally gave in because now you get to share this delicious looking treat with the rest of us! This is a definitely "must try soon"! I can definitely relate to your story. I remember certain food from childhood and I was still refusing to eat, just because of my memory. Then I have kids and wanted to make sure they know those food, so I started to cook...and realize I'm missing our for so many years! That's one of the things I'm thankful for having children. :) Your cashew curry sounds new to me and looks yum!! Wow! I've made a curry with cashews many a times but never had a cashew curry! Amazing recipe, Ramona. Thank you so much I adore cashew curry. Have had cashew curry lots when in sri lanka, but have never been brave enough to make it myself(here in australia) and did not know if I should use roasted or unroasted. Am trying your recipe tonight with pol sambol, I bought a coconut scrapper yesterday. Hope it all goes OK, if not there's yesterdays left over devilled chicken! !